Stone Brewery photo of co-founder and former-CEO Greg Koch. A funny thing happened to Stone Brewing Co. on its way to global expansion and hotel entrepreneurship: 5 percent of its work force got laid off Thursday. ESCONDIDO, CA. — We don’t know how many employees were affected by this. Stone didn’t say. However, the company website said it employs 1,100 people, and industry websites put the number of jobs eliminated at 50 to 75. Some of the layoffs were confirmed as made at the Escondido location although it’s impossible to know how many at this time. Stone officials blamed an “unforeseen slowdown” in business growth for the surprising, and sudden cutbacks. “Due to an unforeseen slowdown in our consistent growth and changes in the craft beer landscape, we have had to make the difficult decision to restructure our staff,” according to a statement the company emailed and attributed to its chief executive officer, Dominic Engels. “Unfortunately, this comes despite a year that includes the incredible accomplishments of opening two new breweries (Richmond and Berlin), which are ultimately expanding the availability of Stone beers and boosting the reputation of American craft beer in Europe,” he said. Overall beer sales in the U.S. were down slightly in 2015, but independent craft beer makers saw about 12.8 percent sales growth by grabbing market share, according to the Brewers Association, a trade group for craft beer producers. The number of U.S. breweries exploded to nearly 4,300 in 2015, from about 1,800 in 2010. Engels started as Stone’s CEO in September, succeeding the company’s founding CEO, Greg Koch, who became executive chairman. Engels had previously served as president of juice company POM Wonderful. 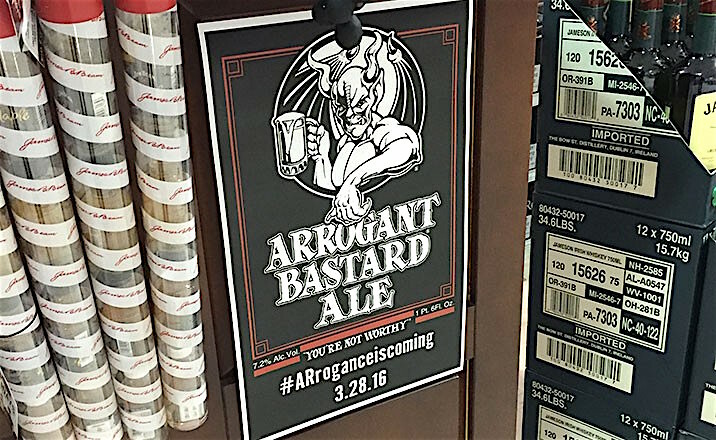 Posters advertising the arrival of Stone Brewing began appearing last year across the state of Arkansas, including this one at Liquor World in Fayetteville. “The team members no longer with our company are talented, committed individuals who have held important roles in our organization, and we expect that their talents will be in high demand,” he said. “No additional layoffs are expected within Stone’s foreseeable future,” he said. The sudden layoffs took the craft beer industry by storm as much as surprise. “We were befuddled,” Draft Magazine said. “Stone is currently the ninth-largest craft brewery in the U.S., having produced more than 325,000 barrels of beer last year, according to the Brewers Association, and it’s expanding at a rapid rate—the brewery opened production facilities in Berlin in mid-September and in Richmond, Virginia in March. Another location in Napa, California is slated to open next year. Stone’s longtime receptionist Denise Ratfield in a Facebook post said: ““It’s a bellwether day, and one that I did not see coming. Today, along with dozens of others, I was laid off from Stone Brewing. Until recently, according to Peter Rowe of the UT, Stone’s business seemed to be booming. Founded in 1996 by Koch and Steve Wagner, it entered 2016 as the nation’s 10th largest craft brewery and California’s third largest, trailing Sierra Nevada (third in the nation) and Lagunitas (sixth). Last year, it produced about 326,000 barrels, or more than 10 million gallons of beer. Stone celebrated its 20th anniversary in August with a festival on the Cal State San Marcos campus, Rowe said. Earlier in the year, it opened a new facility in Richmond, Va.; in September, it became the first U.S. brewery to own a European operation, launching Stone Berlin, he said. More recently however, the larger independent craft segment has developed tremendous pressures. Specifically, the onset of greater pressures from Big Beer as a result of their acquisition strategies, and the further proliferation of small, hyper-local breweries has slowed growth. With business and the market now less predictable, we must restructure to preserve a healthy future for our company. Even given this unfortunate circumstance, we will continue to be fiercely independent and, importantly, Stone remains one of the largest – if not the largest – employers in the craft brewing segment. It is crucial to recognize that this decision was made after much careful consideration. Approximately 5% of all team members were affected, and they were offered a substantial notice period and career transition services. The team members no longer with our company are talented, committed individuals who have held important roles in our organization, and we expect that their talents will be in high demand. This reduction was not a reflection of the work they did, but a careful decision made to ensure that our company will remain competitive and profitable. No additional layoffs are expected within Stone’s foreseeable future. This year, we completed several significant investments that have been in the works for a number of years. A recent decline in domestic growth for the category and for Stone has forced us to restructure in order to preserve our independence in an increasingly competitive category. Stone remains one of the largest – if not the largest – employer in the craft beer segment and remains dedicated to providing our fans with fresh beer. Be the first to comment on "So, you want to work for Stone Brewing"